Said service. This service includes a full sermon, as well as Holy Communion. The style is quiet and contemplative. Contemporary Choral Eucharist together with sermon, hymns and Holy Communion. Refreshments and fellowship to follow. Please join us for an hour of quiet meditation, prayer and singing held in the beauty of candlelight. All are welcome. Join us for some or all of an evening of contemplation - prayer and mediation - when we remember our love for the world, for its people, for creation. Join your heart with our hearts for this holy time and for this sacred work. A living last supper followed by Tenebrae. Hosted by Faith Lutheran and St James Anglican Churches. To be held at Faith Lutheran, 290 Belsyde Ave E, Fergus. 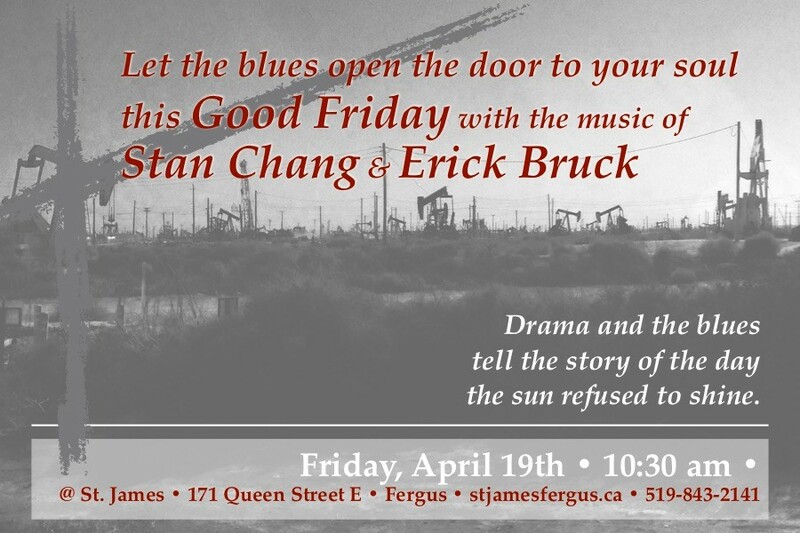 Let the blues open the door to your soul this Good Friday. Drama and the blues tell the story of the day the sun refused to shine. Music with Stan Chang and Eric Bruck. "In stillness, earth awaits the resurrection." Join us for a Taizé Eucharist.